The Advanced Sozo teaching builds upon the Basic Sozo teachings and is meant to be a powerful resource for the furthering of your own deliverance/inner healing ministry. 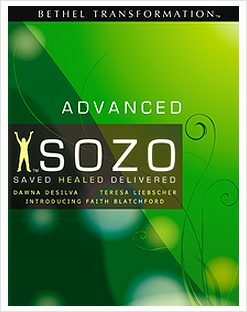 The Advanced Sozo teaching draws from years of deliverance that Dawna DeSilva and Teresa Liebscher have progressed through. This set builds upon the Basic Sozo teachings and is meant to be a powerful resource for the furthering of your own deliverance/inner healing ministry. New Resources Include: Healing post-traumatic stress, dealing with early childhood beliefs, breaking free of curses and familiar spirits, prophetic deliverance and ministering to disassociative individuals. An added benefit of the advanced series is the Shabar Ministry tools which are included. This training is best absorbed when used with the Sozo Advanced Training Manual. Manual for the advanced training of the Sozo inner healing ministry. This newly revised third edition for the Sozo Advanced Training Manual, includes a new section on the place of the Prophetic and another on Body Work as well as updates and tweaks to most sections. The previous (second) edition had a REVISED EDITION black stripe on the front cover but does not have these new sections & latest updates. It included revisions in the Shabar part of the manual. The Track 2 and 3 sections have new information and added information that clarifies the process. Teresa Liebscher has added some information to the Integration Section and a section for information on how to provide support afterwards. The booklet “Life after Integration” will also be helpful in this regard. If you are working with an Advanced Manual without that stripe – then yours is an original first edition, but very much out of date.